Chickapig: A Farm-To-Table Board Game, For Manure Audiences Virginia guitar maker Brian Calhoun devised a strategy game called Chickapig. (It features hybrid animals and pooping cows.) Now he's getting some friends — like Dave Matthews — to spread the word. 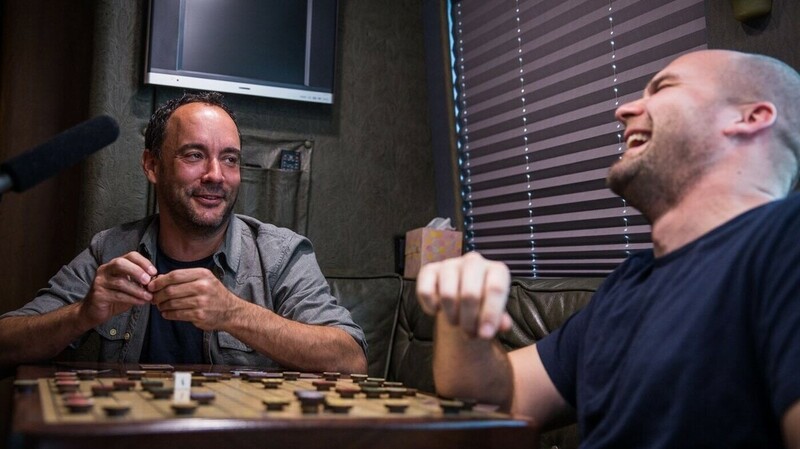 Brian Calhoun (right) makes guitars for musicians like Dave Matthews, but his newest creation is a board game called Chickapig — and he had a board custom-installed in Matthews' tour bus. Poo is just one of the obstacles as you make your way across the board. The goal is to get your flock of fantastical creatures safely to their destination (and poo-free). And Matthews wants to make it hard for his playing partner Brian Calhoun. The board game is called Chickapig, and has been dubbed "farmer's chess." It was created by Calhoun, a Virginia-based luthier who's made acoustic guitars for some of the biggest names in country and roots music — Matthews, Keith Urban and Mary Chapin Carpenter among them. Up until now, the game has been pretty much like his guitars: custom-made and available only by mail. But that may change with a new children's book and plans for sales in stores. Calhoun says he devised the little chicken-pig hybrids that give the game its name while doodling. He turned them into game pieces in his guitar shop. "The very early Chickapig pieces, I was going through our guitar scrap wood and pulling out scraps from, like, nice red spruce tops and cutting them into little squares and drawing chicken-pig hybrids on them with colored pencils," Calhoun says. Calhoun grew up on a farm and only intended to share the game with his friends. But word got around, and he enlisted his mom to make the cow pieces out of clay. Eventually demand became so great that he turned to a local printing company in his home base of Charlottesville, Va.
"They can cut out the Chickapigs with the laser and it leaves this cool, kind of burnt edge and it just looks organic," Calhoun says. "It looks like it was made on a farm somewhere." The fact that everything is local appeals to Dave Matthews, who has a home in Charlottesville. "I'm not a crazy gamer, but it's really original," he says. "I just think it's a brilliant variation on a very traditional idea." Matthews is now a partner, helping to make promotional videos and posting them on social media. Meanwhile, in Virginia, Brian Calhoun hosts Chickapig events at local vineyards and bars. It was at one of these game nights that Calhoun gained a fan in Pete Fenlon, a board game publisher whose credits include the popular German game Settlers of Catan. "The No. 1 and the No. 2 features of a great game is that it's fun, and that it's fun," Fenlon says. "And in the case of Chickapig, it was fun. And there was some depth to it." Fenlon became an unpaid mentor to Calhoun, answering questions about development and marketing. Calhoun turned to Kickstarter, raising enough money to produce 5,000 games. In much the same way he built his guitar business, demoing instruments at concerts and festivals, Calhoun took a batch of games to various events, setting up Chickapig tents. He says they soon filled with kids. That's when he got the idea to bring Chickapig into the classroom. He partnered with the Charlottesville Area Independent Schools, which was looking for intramural activities to get students from different schools together. They formed their own Chickapig leagues, and sixteen-year-old Mattias Zuffoletti was one of the team captains. "You can make comparisons to chess, or I like to say it's like pool because you have to — every move is a set-up and it's all about the ricochets and the angles," Zuffoletti says. "But it's like nothing you've ever played before, and it's a ridiculously fun time. It's awesome." It's also helped students at the Virginia Institute of Autism develop their social skills, according to teacher Jake Frazier, who invited Calhoun to speak in a class on entrepreneurship. "To bring him in as an inventor, to talk about how he just liked guitars and then he wanted to make guitars and how it was just a hobby and turned into a successful business, just from scratch, and everything's local, I thought it was like the best motivation for them," Frazier says. "This guy had a dream and he made it possible. You're completely capable, autism or not, to do the same exact thing." Eventually, Chickapig got its own tour vehicle. Former US Chess champion Judah Brownstein, a friend of Calhoun's, set off for the West Coast in a custom-painted van to promote the game. "Up-and-coming bands, they have street teams," Calhoun says. "If they go to a town, they have people that help them out just because they like the band. And so we're asking people, help us host these events by inviting all of your friends, and Judah shows up and teaches everybody how to play. It's a free party ... it's like a band playing a house show." As Chickapig makes its way across the country, Dave Matthews has another idea for Calhoun if he ever wants to make a different model. "I just think you should make a guitar with a Chickapig board on the back with magnets in it so you can play some bluegrass and then you can flip over the guitar," he says, laughing. Or you could just get a board installed in your tour bus.